x, x1, and x2 are finite scalars, and f(x) is a function that returns a scalar. x = fminbnd(fun,x1,x2) returns a value x that is a local minimizer of the scalar valued function that is described in fun in the interval x1 < x < x2. x = fminbnd(fun,x1,x2,options) minimizes with the optimization options specified in options. Use optimset to set these options. x = fminbnd(problem) finds the minimum for problem, where problem is a structure. Create problem by exporting a problem from Optimization app, as described in Exporting Your Work. [x,fval] = fminbnd(___), for any input arguments, returns the value of the objective function computed in fun at the solution x. [x,fval,exitflag] = fminbnd(___) additionally returns a value exitflag that describes the exit condition. [x,fval,exitflag,output] = fminbnd(___) additionally returns a structure output that contains information about the optimization. Find the point where the sin(x) function takes its minimum in the range 0<x<2π. To display precision, this is the same as the correct value x=3π/2. Minimize a function that is specified by a separate function file. A function accepts a point x and returns a real scalar representing the value of the objective function at x. Write the following function as a file, and save the file as scalarobjective.m on your MATLAB® path. Find the x that minimizes scalarobjective on the interval 1 <= x <= 3. Minimize a function when there is an extra parameter. The function sin(x-a) has a minimum that depends on the value of the parameter a. Create an anonymous function of x that includes the value of the parameter a. Minimize this function over the interval 0<x<2π. For more information about including extra parameters, see Parameterizing Functions (MATLAB). Monitor the steps fminbnd takes to minimize the sin(x) function for 0<x<2π. Find the location of the minimum of sin(x) and the value of the minimum for 0<x<2π. Return all information about the fminbnd solution process by requesting all outputs. Also, monitor the solution process using a plot function. Function to minimize, specified as a function handle or function name. fun is a function that accepts a real scalar x and returns a real scalar f (the objective function evaluated at x). Lower bound, specified as a finite real scalar. Upper bound, specified as a finite real scalar. Check whether objective function values are valid. The default 'off' allows fminbnd to proceed when the objective function returns a value that is complex or NaN. The 'on' setting throws an error when the objective function returns a value that is complex or NaN. 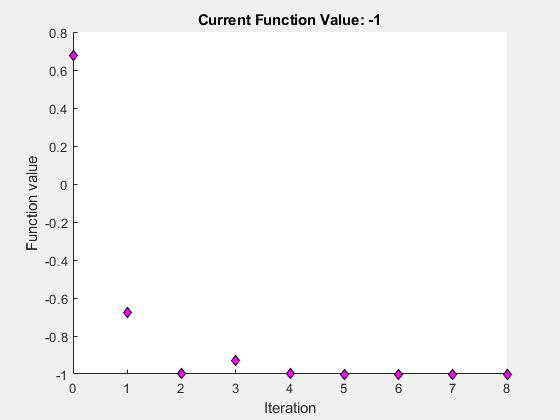 Maximum number of function evaluations allowed, a positive integer. The default is 500. See Tolerances and Stopping Criteria and Iterations and Function Counts. Maximum number of iterations allowed, a positive integer. The default is 500. See Tolerances and Stopping Criteria and Iterations and Function Counts. Plots various measures of progress while the algorithm executes, select from predefined plots or write your own. Pass a function handle or a cell array of function handles. The default is none (). Termination tolerance on x, a positive scalar. The default is 1e-4. See Tolerances and Stopping Criteria. Solution, returned as a real scalar. Typically, x is a local solution to the problem when exitflag is positive. For information on the quality of the solution, see When the Solver Succeeds. Reason fminbnd stopped, returned as an integer. The bounds are inconsistent, meaning x1 > x2. The function to be minimized must be continuous. fminbnd might only give local solutions. fminbnd can exhibit slow convergence when the solution is on a boundary of the interval. In such a case, fmincon often gives faster and more accurate solutions. fminbnd is a function file. The algorithm is based on golden section search and parabolic interpolation. Unless the left endpoint x1 is very close to the right endpoint x2, fminbnd never evaluates fun at the endpoints, so fun need only be defined for x in the interval x1 < x < x2. If the minimum actually occurs at x1 or x2, fminbnd returns a point x in the interior of the interval (x1,x2) that is close to the minimizer. In this case, the distance of x from the minimizer is no more than 2*(TolX + 3*abs(x)*sqrt(eps)). See  or  for details about the algorithm. Forsythe, G. E., M. A. Malcolm, and C. B. Moler. Computer Methods for Mathematical Computations. Englewood Cliffs, NJ: Prentice Hall, 1976. Brent, Richard. P. Algorithms for Minimization without Derivatives. Englewood Cliffs, NJ: Prentice-Hall, 1973.
fminbnd does not support the problem structure argument. fminbnd ignores the Display option and does not give iterative display or an exit message. To check solution quality, examine the exit flag. fminbnd ignores the OutputFcn and PlotFcns options.